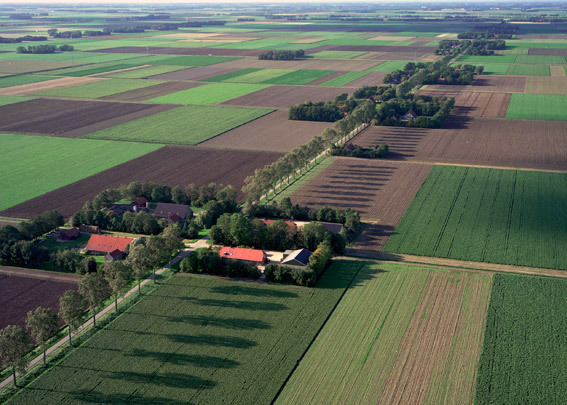 Noordoostpolder (North East Polder) was the second polder after Wieringermeer to be created as part of the Zuiderzee Works. Both combine functional hydraulic engineering and agricultural frames of reference with traditional ideas on planning and landscape. Wieringermeer was drained between 1927 and 1929, two years before the Afsluitdijk was in place. M.J. Granpré Molière was involved in parcelling the polder landscape. Noordoostpolder was laid out between 1936 and 1942 to a design overseen by Granpré Molière and Verhagen. The landscape was divided into standard lots of 300 x 800 m. Altogether, some 1000 arable, 500 mixed, 225 horticulture and 93 state-owned farms were planned. These were constructed to a standard design, their barns fully prefabricated and assembled on site. Tree cover consisted mainly of linear elements supplemented by three forested areas. The former islands of Urk and Schokland were taken up in the landscape and picked out with screens of trees. Sitting at the intersection of the main roads through Noordoostpolder is Emmeloord, the local administrative centre. Its water tower (Poldertoren) is the polder's symbolic heart. Ten villages lie in a circle round Emmeloord. Each has a main square boasting three churches for the principal denominations; the villages' population makeup reflected the 'pillarization' or religious-political division in Dutch society. The small-scale housing is of traditional brick design with gable roofs. The churches vary from utterly traditional to ultra-modern. Most of the villages were designed by the architectural section of the Wieringermeer management. Only Nagele was claimed by the modernist architects and urbanists of the Amsterdam functionalist circle De 8.